Is This Excel Worksheet Protected? » Accounting Advisors, Inc.
Is This Excel Worksheet Protected? Long-term Excel users are familiar with the prompt shown in Figure 1. 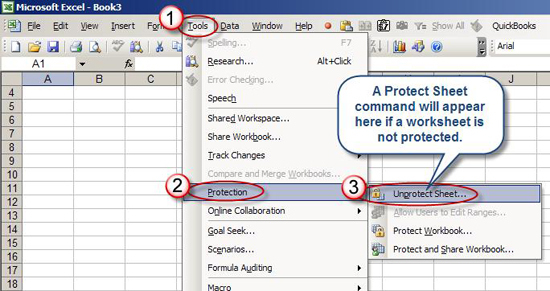 In Excel 2003 and earlier, there were two ways to determine if a worksheet was protected. One way involved attempting to modify a locked cell, which would trigger the aforementioned prompt. The second approach involved choosing Tools, Protection, and looking for the Unprotect Sheet command, as shown in Figure 2. 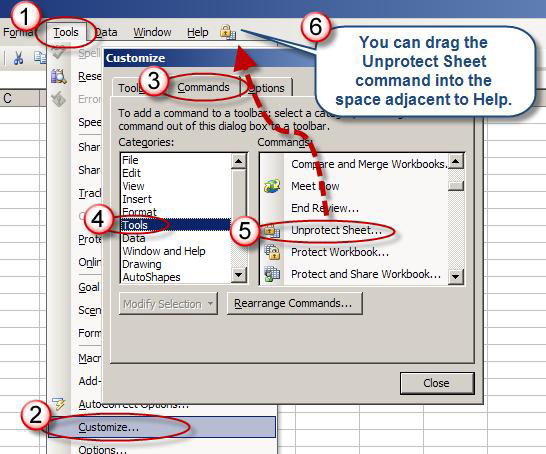 Excel 2007 makes this determination a little easier, as the Review tab displays an Unprotect Sheet command, shown in Figure 3, when you activate a protected worksheet. Figure 1: A typical prompt that appears in Excel when a user attempts to modify a locked cell on a protected worksheet. Figure 2: Multiple clicks are required to unprotect worksheets in Excel 2003. Figure 3: You can tell from a glance at the Review tab if a worksheet is protected in Excel 2007. Regardless, in Excel 2007 and earlier, you're required to activate each sheet in turn before you can turn off worksheet protection. In Excel 2003, this can require significant mouse clicks, whereas Excel 2007 streamlines the process somewhat since you can keep the Review tab active. Fortunately, Excel 2010 users have a much easier approach at their disposal. 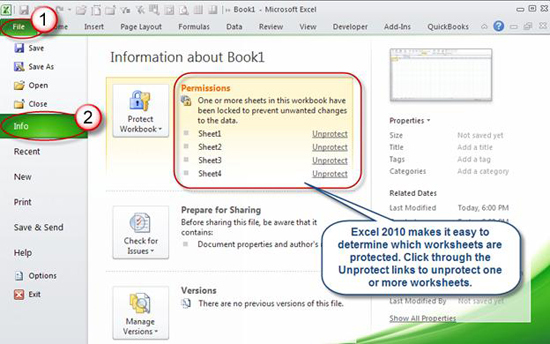 As shown in Figure 4, Excel 2010 users can choose File, Info, and then determine at a glance exactly which sheets within a workbook are protected. Users can then turn off protection via the Unprotect links. Figure 4: The Info pane in Excel 2010 provides a list of protected worksheets. Excel 2010 users can also utilize the Review tab as shown in Excel 2007, but keep the Info pane in mind should you need to turn off protection on multiple worksheets within a workbook. If you're still using Excel 2003, there's a way you can eliminate a couple of steps involved with protecting or unprotecting worksheets by following the steps shown in Figure 5. Figure 5: A toolbar customization in Excel 2003 can streamline worksheet protection tasks.